Altman and Hallström will get the Criterion treatment in August. 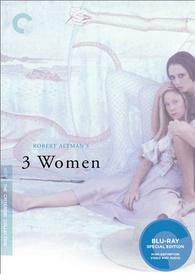 In an early announcement to retailers, Criterion has just revealed '3 Women' is being prepared for Blu-ray on September 13. In a dusty California resort town, a naïve Southern waif finds her role model in a fellow nurse, but her hero-worship evolves into something stranger and more sinister than either could have anticipated. Robert Altman’s dreamlike masterpiece careens from the humorous to the chilling to the surreal. The Blu-ray will feature 1080p, an uncompressed mono soundtrack, and supplements include: Audio commentary by director Robert Altman, Rare production and publicity stills, original theatrical trailers and television spots, and a booklet featuring an essay by critic David Sterritt. Criterion is also readying 'My Life as a Dog' for Blu-ray on the same date. 'My Life as a Dog' tells the story of Ingemar, a working-class twelve-year-old sent to live with his uncle in a country village when his mother falls ill. Once there, Ingemar finds refuge from his misfortunes and unexpected adventure with the help of the town’s warmhearted eccentrics. The Blu-ray will feature 1080p video, an uncompressed mono soundtrack, and supplements will include: Shall We Go to My or Your Place or Each Go Home Alone? (1973), a fifty-two-minute film by Hallström; Video interview with Hallström from 2003; original theatrical trailer; and a booklet featuring an essay by film critic Michael Atkinson and an appreciation by the late author Kurt Vonnegut. You can find the latest specs for '3 Women' and 'My Life as a Dog' linked from our Blu-ray Release Schedule, where they're indexed under September 13.